The interior of the Bantam Cafe in Winterport. 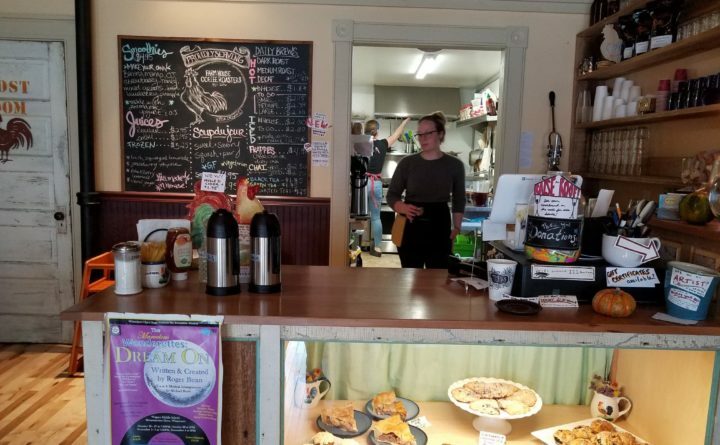 Though she had worked in restaurants for most of her adult life, around this time last year, Wesley Osterhout, the owner of Bantam Cafe in Winterport, was ready to throw in the towel on the kitchen life. She was almost done with massage therapy school. Perhaps, she thought, it was time to move on. Until, on a whim, she and her former boss at the Whale’s Tooth Pub in Lincolnville went to check out a newly available restaurant space in downtown Winterport — 111 Main St., to be exact, a tiny spot formerly home to first iteration of the now-defunct Bacon Tree, and the short-lived Mexican taqueria Amigos. Osterhout, 28, an Orono native, changed her mind. Not long after, she bought the small, run-down building, and she and her dad embarked on a six-month renovation effort. The Bantam Cafe, which opened in May of this year, is a breakfast, brunch and lunch spot focused on a mixture of healthy, wholesome menu items and more decadent brunch classics, as well as an array of baked goods. In the six months since it opened, Osterhout says it has garnered rave reviews from locals and from tourists alike. Chef Wesley Osterhout, at the Bantam Cafe with her signature menu item, the Nest Egg Salad. 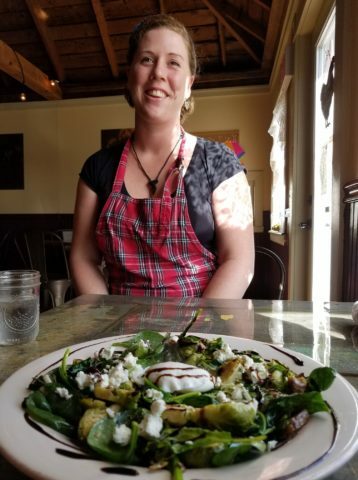 Osterhout said one of her signature dishes is the Nest Egg Salad, a warm salad made of sauteed Brussels sprouts, greens, goat cheese and maple sausage, topped with a poached egg and a balsamic reduction. She also offers up sweet and savory crepes, huevos rancheros and house-made juices such as citrus ginger or blackberry mint. For lunch, there are paninis such as the Appenzeller (roasted chicken, brie, apple, figs and caramelized onion) and a Reuben made with house-made corned beef and Morse’s sauerkraut. Daily baked good offerings include scones, muffins, breads and cookies. The majority of the menu is $11 or under, and there are lots of vegetarian, vegan and gluten-free options. Born in western Maine to a back-to-the-land family, at age 14 Osterhout moved to Orono with her mother, where she graduated from Orono High School in 2008. She worked at a number of restaurants and cafes over the years, including the long-gone Blues Cafe in Orono, the Natural Living Center in Bangor, and the Whale’s Tooth Pub and the Inn at Ocean’s Edge, both in Lincolnville. Osterhout credits her homesteading childhood and years working at the Natural Living Center with instilling in her a love of natural, healthy foods. The renovations revealed a timber frame roof, which Osterhout and her father refinished back to its warm brown tone. They installed brand new walls and floors, and removed the massive bar that dominated most of the dining room, which increased the seating. Though from the exterior it doesn’t look very different from the way it looked for previous restaurants, the interior is completely changed. It’s just Osterhout in the kitchen, so her small dining room — which maxes out at around 30 people — means that she is rarely overwhelmed. It also allows for an intimate, convivial, relaxed experience for the diner. The Bantam Cafe is open from 7 a.m. to 2 p.m. Thursdays, Fridays and Mondays, and 8 a.m. to 2 p.m. Saturdays and Sundays. For more information, like them on Facebook.